Back from my summer holiday, finishing the Cockroach Cluster! Back from the summer holidays at last, I am trying to get something done about all the stuff just standing about and cluttering up my shelving. Lots of it is just standing around awaiting undercoats or what not. I have started with some of those that have gone a step beyond the undercoat, first up is the rest of the Space Hulk Genestealers have been standing about needing some TLC for a while. I have been thinking alot about how to base them, as many of them simply are not stable enough on their integral scenic base. But seeing as the integral bases are all rectangular and many are built up, the 25mm round bases Genestealers use in 40k do not fit, and I did not want to use 40mm bases, as that would make them difficult to conga-line up in the game, I have not done anything about them. A few weeks ago I came across some oval laser cut wooden bases by Warbases.co.uk, and after some testing I decided to base them with those. I had to use three different sizes to accommodate the diverse minis. In game I have to stand the minis sideways to fit them on the boards when they are in a conga line, but I usually have to do that anyway, so I don’t mind that at all. I painted the bases simple black and finished them with the same black flock I use on my Dreadball minis, as I simply could not be arsed to detail the bases any more then they already are. I think it works. 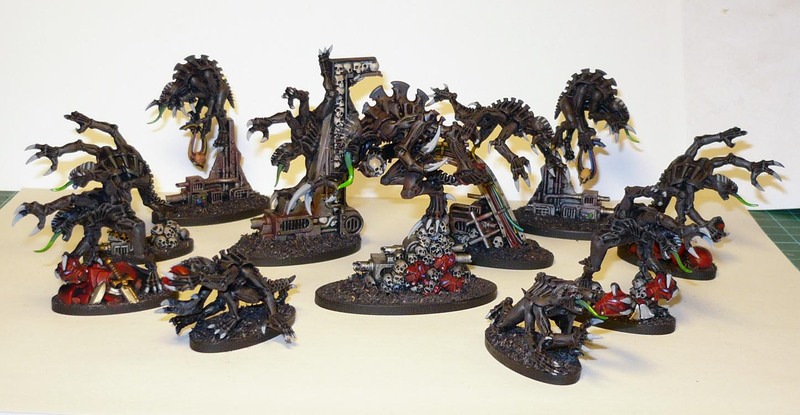 I have also rebased all the previously finished Genestealers, now they are all done!